In the year or so since Ding How reinvented itself and opened its doors in Ridgeland, the Asian dining scene in Jackson seems to have begun a small, but fundamental shift. Outside of the obvious, e.g. the staggering appearance of dim sum in Jackson, there have been other changes like The Van Hung Grocery on Highway 51 has moved into a larger, nicer facility. Customers still flock there on Friday afternoon for the fresh vegetables and banh mi, but there’s now an option in Jackson. Of course, with the opening of the Asian Market in the old Chuck-E-Cheese location, there’s an unheard of amount of fresh Asian produce as well as a new non-buffet Chinese restaurant. I may be over simplifying it, but I have to credit Ding How with some of this transformation. 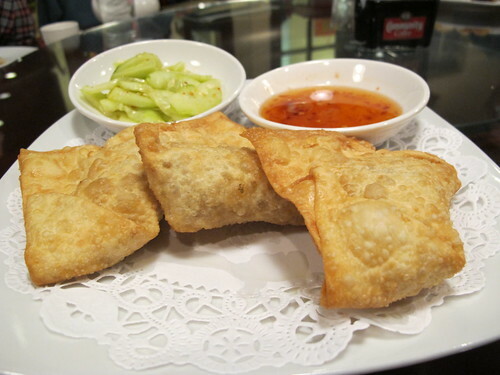 Outside of partially crediting Ding How for new Asian cuisine in Jackson, I last wrote about Ding How’s dim sum in December 09 and April of last year. Since then I’ve had the nagging feeling that their everyday menu deserved a proper look. Needless to say, I haven’t had the fastest response time to this problem. In fact, it wasn’t until December 2010 that I actually ate dinner at Ding How, but with family from Houston in tow, it was a pretty fair overview of the menu. With six people at the table, there was plenty of food to fill up the lazy Susan. Of course things started with a variety of appetizers. As soon as we ordered the curry puffs arrived to the table, I thought they looked like samosas. 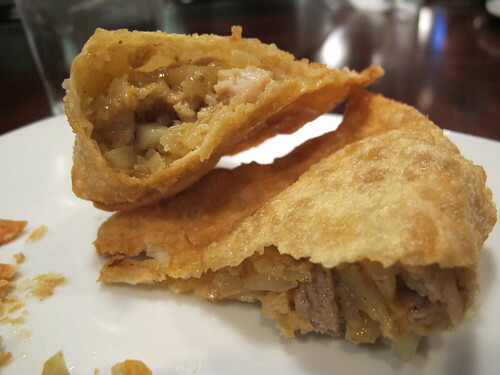 Stuffed with a filling of chicken, onions, and potatoes, they were very much like a samosa. On the menu, the curry puffs are labeled as a Malaysian dish; I can’t really comment on their authenticity, but I can say they had a pleasant curry flavor and were quite tasty. 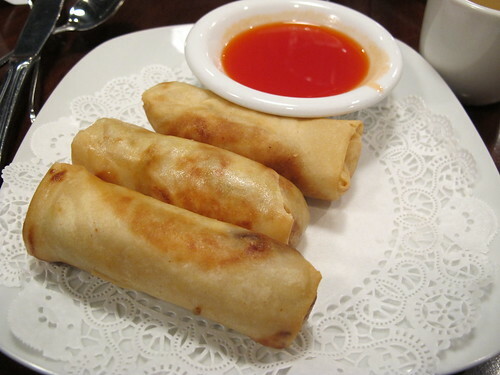 Nicely fried and full of shrimp, they were everything you could hope for in a spring roll. Another wrapped item soon followed the spring rolls. 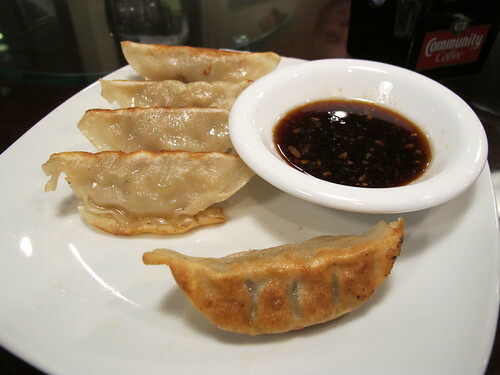 One could criticize Ding How for being a little too pan-Asian in their menu selection, but can you really turn down a good gyoza? While my favorite gyoza in Jackson still comes from Little Tokyo, these are a fair substitution. 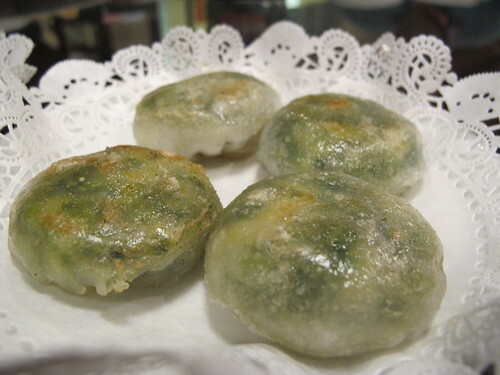 Making an appearance on both the dim sum cart and the appetizer section of the menu, the shrimp chive cakes were brought to the table. If you get these cakes fresh from the cook top, they are delicious, but if steam is allowed to soften the perfectly cooked wrapper, then all is lost. For those with a predilection for the spicy, neigh mouth searing, Ding How has just the thing for you. 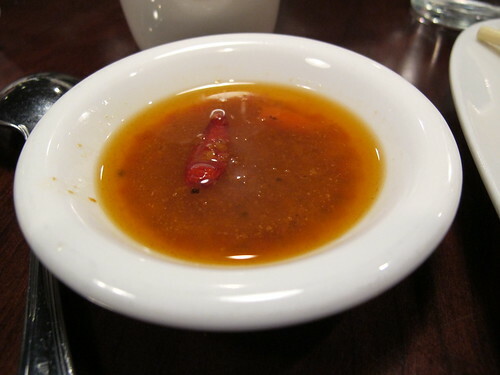 This was only a bowl of level 8 spicy sauce, but it was more than enough to wipe out any flavors and make things fiery hot. I haven’t had the gall to ask for level 10, but maybe next time. If there was one slight disappointment in the meal, it came with the complimentary soup. 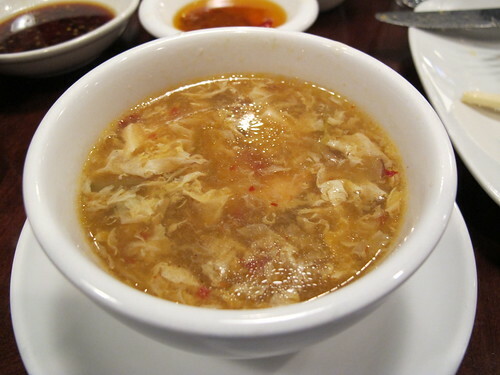 While this may be labeled as hot and sour soup, it looks suspiciously like egg drop soup to me. There was plenty of chicken in this bowl of soup, but the Chinese equivalent of Balsamic vinegar, Chinkiang vinegar, was conspicuously absent. The first entrée to the table came from the seafood, or dishes from the sea section. Ever since Golden Dragon closed their doors, I’ve been telling people to look to Ding How, but I was worried I could never replace Mr. Lee’s Lobster Cantonese. 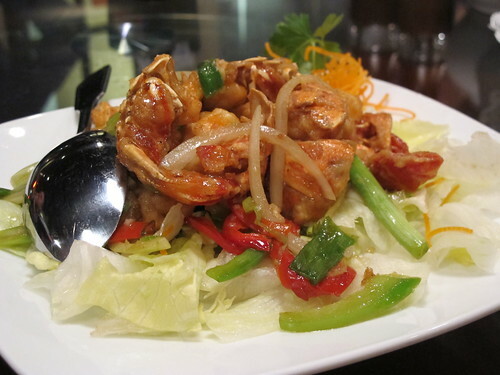 Well, the Hong Kong Style Lobster may be a little different but it’s just as tasty. Each bite of lobster is juicy and loaded with savory ginger. While the lobster may be a little messy, it’s completely worth the effort. 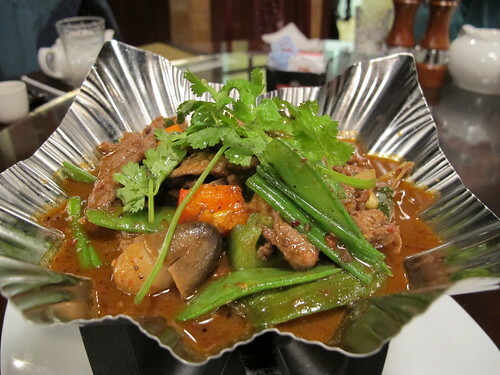 Served on an angular metal bowl and perched on a small flame, the Flaming Steak Wok seems to be Ding How’s approachable foray into the world of Sichuan cooking. Tender beef, sizeable mushrooms, and a complimentary amount of leeks make up the bulk of the Flaming Steak Wok, the rest is comprised of an excellent sauce with just a touch of Sichuan peppercorns. Your mouth may not come away completely numb, but there’s just enough prickly ash to let know you what you’re eating. This has quickly become one of my favorites at Ding How and not just for the fire. Labeled as a special for that night, I was surprised to see this next dish also holds a regular spot in the seafood section. 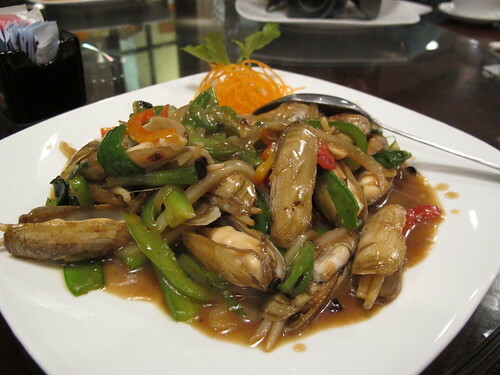 Little neck clams stir fried with a black bean sauce is a delightfully salty combination. Much like the Hong Kong Lobster, these clams are messy to eat but they are worth the effort. If you look through the menu at Ding How, you’ll notice that a few dishes have a level next to them in parentheses. With these dishes, the heat level can be adjusted from level one to ten. Of course, this piques my curiosity about just how hot a level ten dish would be. Well, the Ding How Hot Pepper Chicken may only be a level three, but that was soon the least of my concerns. Each piece of chicken was succulent with crispy exterior and an oh so juicy interior. The sauce was sweet with just a subtle heat to it. There was nothing alarming about the spiciness; it was just a delicious sauce. 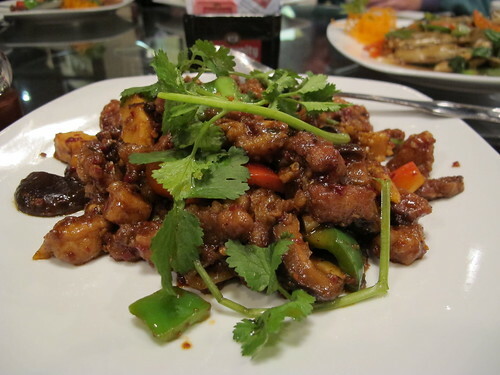 Hoping to up the ante, the Hunan Spicy Chicken with Popping Pepper was the last dish I ordered for the table. The chicken was well cooked but it was the heat that interested me. It was a building heat that plateaued into a manageable level of spice. It lingered for a while after but this level 8 dish was very anticlimactic as far as spiciness goes. 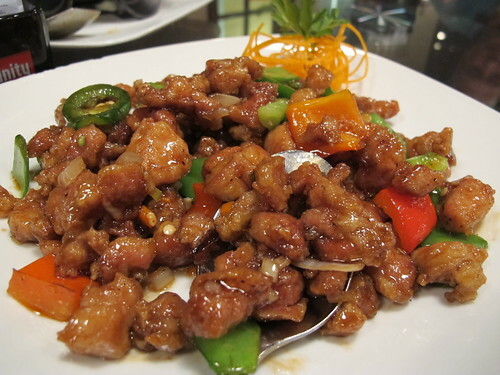 More importantly it was still a nice dish, but the How Pepper Chicken is the better of the two chicken dishes. As I said before, since the Golden Dragon shut down, I’ve been trying to find a replacement for go to Chinese food in Jackson. When people emailed or commented, I told them to take a look at Ding How, but I was only doing so as an automatic response. After this meal and a few others, that’s changed. I’ve tried a fair portion of their menu, from the Sichuan Hot Pot to the Hong Kong Lobster, and I can say without reservation that Ding How is setting a new standard for Chinese food in Jackson. More importantly, Ding How is my new choice for dine in and take out Chinese. "For those with a predilection for the spicy, neigh mouth searing, Ding How has just the thing for you." "Neigh" is a horsey sound; the word you were looking for is "nay."